I am Jun from South Korea and my Naxi wife, Christin, from Shangri-La – we would like to welcome you to our Hostel, Tavern 47. I met my wife when I was backpacking in Yunnan 7 years ago and we fell in love. 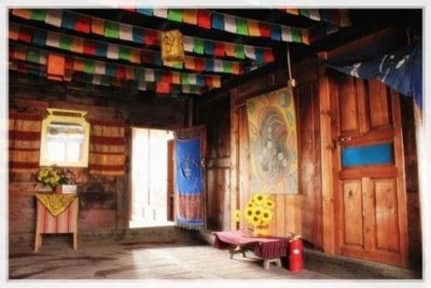 Open throughout the year, Tavern 47 Hostel is a traditional wooden Tibetan house, full of character and charm. Affordable, cosy atmosphere , clean, comfortable and with 24 hour hot water, our Hostel is ideally located on a quiet street, only 120m or so from the main square of Shangri-La Old Town. All beds come with electric blanket and a comfortable mattress to ensure a good night’s sleep as well as individual bedside lamps, power sockets and lockers. Private rooms are also supplied with a kettle. En suite rooms with attached bathroom benefit from a supply of complimentary toiletries. Relax and make new friends around the communal wood-burning fire place. 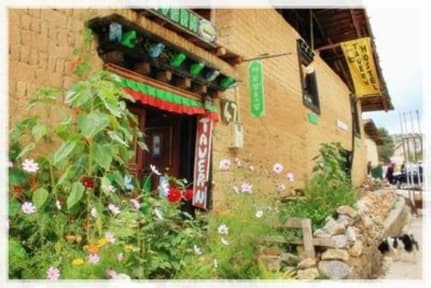 In addition to providing a knowledgeable and conscientious travel service, a laundry service (up to 6kg) for as little as 15 Yuan, guests can enjoy anything from authentic, fresh Korean and Chinese Naxi food to arguably Shangri-La’s best Yak Burger from our extensive international food and drink menu. This is the only place I'd ever want to stay in Shangri-La. Jun is not only a great host, but a great man as well. He made a long trip from Kunming just to meet us on arrival. He is an awesome cook and a fun conversationalist. The city is freezing cold with snow around this time but the blanket warmers really help. The showers are perfectly hot. You can do laundry easily. The location is ideal. Jun makes transport and tours easy. I couldn't thank Jun enough for the awesome hospitality. Tavern 47 is an excellent choice for a hostel when staying Shangri-la. The staff is wonderful and the food is fantastic! Nicest place. The location was ideal, close to everything in town. The staff were amazing, kind, helpful and a lot of fun to play card games with. They were really helpful when organising details and the atmosphere of the whole hostel was excellent. The food was fantastic and it was the best fried rice that my friend and I have ever tried. The atmosphere of the hostel are very peaceful and cozy. The room are clean and complete with heaters and locker. Owner/employee are very helpful in guiding us on where to go and book tickets. It is located very near to the old town. Bus stop are also near to the hostel to make it convenient. The Korean owner (sorry forgot your name! And pls tell us the name of the peak we went to?) was so friendly and gave us great travel tips. Very nice to get to know him and his story. Great vibe, lovely details in the hostel. He helped us arrange a day hike with a local Tibetan guide. Sadly we met the first snow day of the year and couldn't see anything! We came back tired and cold but felt warm immediately when we were welcomed with hot soup and a heater prepared for us. Hope to visit again! Great place to stay! The owner's were great. Had good talks with Jin and good sleep with the house cat! Thanks to this place I had great experience in Shangri La! Great hostel!!! Stayed for 4 nights. Jun is very nice and helpful, location is great and food as well. Highly recommend to stay here when in Shangri-la. Great stay. Great people, help and food! Electric Blanket! Really cute place and great for meeting other travellers. Fire place / heater in the common area is great for warming up in the winter when it can be VERY cold. Nice atmosphere. Great food (try the yak burger!). Good location in the old town. Bathrooms not amazing.